Crosses have been placed on the lawn outside the old Masterton Town Hall in Chapel Street ahead of the Armistice Day centenary on Sunday. There are 312 of them and each represents a Wairarapa soldier who died in World War I. The crosses have been put there each Anzac Day since 2014, the centenary of the start of World War I, as part of the Fields of Remembrance project. This year they are being put out for Armistice Day, which effectively ends the centenary commemorations of World War I. The war ended on the 11th hour of the 11th day of the 11th month of 1918. The crosses will be on the grassy lawn until Tuesday. On Sunday a big crowd is expected at the cenotaph in Queen Elizabeth Park at 11am for a service, said RSA President Trevor Thompson. He said returned servicemen will be joined by dignitaries, families of those who served, service personnel and members of the public, including school children. This year mounted troopers from both the Australian 6th Light Horse Regiment and the Canterbury Mounted Rifles Regiment are at the services in Masterton and Featherston. The light horse brigades from both sides of the Tasman served together at Gallipoli and there will be a talk at the RSA in Masterton about it after the service, said Thompson. Defence Minister Ron Mark, who lives in Carterton, can’t attend the Masterton service but will have a representative there to lay a wreath. The Masterton District Brass Band will be there. The exact number of Wairarapa men who served in World War I is difficult to calculate but is likely to be more than 2000. 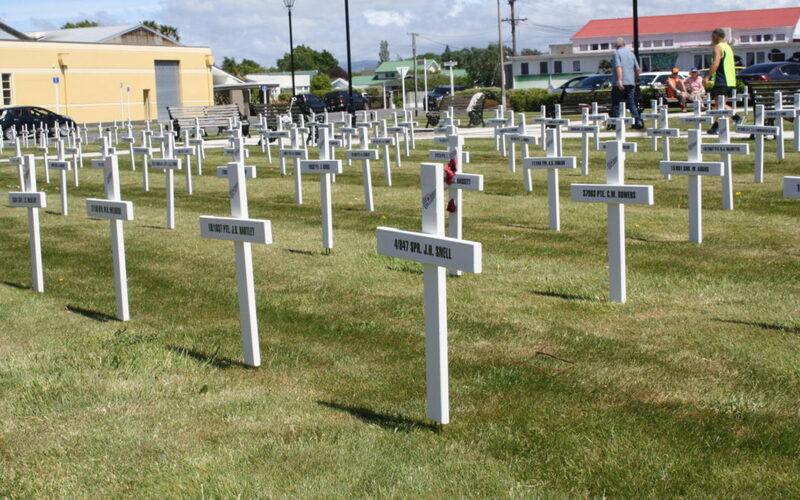 On war memorials in the Masterton, Carterton and South Wairarapa districts, there are 543 men and one woman who died as a result of the Great War, according to WW100 Wairarapa. In 1914, just over 30,000 people lived in the Wairarapa area, from Woodville to Palliser Bay.